Bonobo (real name Simon Green) is a British producer, composer, musician and DJ. 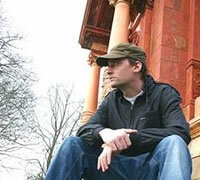 At 18, he moved to Brighton where he released his debut album Animal Magic on the Tru Thoughts label in 2000. With this album, completely self-produced and mainly self-instrumented, he became one of the "new downtempo pioneers" and his chilled, beat-driven music captivated press as well as many major labels. In 2001, Bonobo decided to sign for Ninja Tune and in 2003, after one album of remixes on Tru Thoughts in 2002, he released Dial 'M' For Monkey. In 2005, Bonobo contributed to the Solid Steel series, with his Bonobo Presents Solid Steel: "It Came From The Sea". The release date was scheduled for October 10, 2005, but was released a week early. The mix features several exclusive tracks as well as remixes and re-edits. His latest album, entitled Days to Come, was released on October 2, 2006. The first single from the album, "Nightlite", featuring vocals by Bajka, was released on August 14. In 2005, "Pick up" and "Flutter" from the Dial 'M' For Monkey album, was featured in the popular snowboardgame SSX on Tour. In 2007, Bonobo's track "Ketto", was featured in a Citroen C4 Picasso advertisement. Bonobo uses a wide variety of samples - mainly ethnic - in his music combined with heavy, often complex basslines. His music generally develops linearly - with new elements such as basslines or percussion coming in one after the other. In Days to Come, he mixes this sonic background with the clean yet distinctive vocals of Bajka, who often uses harmony to build up a multifaceted sound.